The main suspect behind Alzheimer's is a protein called "amyloid-beta". Researchers asked, "Why do older people have more of it?" The greatest risk factor for Alzheimer’s disease is advancing age. After 65, the risk doubles every five years. As many as half of the elderly who are over 85 are estimated to be living with some type of dementia, usually Alzheimer's. A sizable study demonstrated that in our 30s, a healthy brain clears amyloid-beta every four hours. At 80 years old, it takes more than 10 hours. This may explain the link between age and Alzheimer's, as well as what we need to do to fight this disease. Researchers at Washington University School of Medicine in St. Louis have identified some of the key changes in the aging brain that lead to the increased risk. The changes center on amyloid beta 42, a main ingredient of Alzheimer’s brain plaques. The protein, a natural byproduct of brain activity, normally is cleared from the brain before it can clump together into plaques. Scientists long have suspected it is a primary driver of the disease. 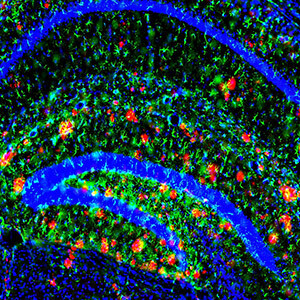 A new study reveals that the brain's ability to clear the main ingredient of Alzheimer's plaques slows with age (the plaques are red in this image). The findings could help explain why risk of the disease increases with age. The slowdown in clearance results in rising levels of amyloid beta 42 in the brain. Higher levels of the protein increase the chances that it will clump together to form Alzheimer’s plaques. The results appear online in the Annals of Neurology. For the study, the researchers tested 100 volunteers ages 60 to 87. Half had clinical signs of Alzheimer’s disease, such as memory problems. Plaques had begun to form in the brains of 62 participants. The subjects were given detailed mental and physical evaluations, including brain scans to check for the presence of plaques. The researchers also studied participants’ cerebrospinal fluids using a technology developed by Bateman and co-author David Holtzman​, MD, the Andrew B. and Gretchen P. Jones Professor and head of the Department of Neurology at Washington University. The technology — known as stable isotope-linked kinetics (SILK)— allowed the researchers to monitor the body’s production and clearance of amyloid beta 42 and other proteins. In patients with evidence of plaques, the researchers observed that amyloid beta 42 appears to be more likely to drop out of the fluid that bathes the brain and clump together into plaques. Reduced clearance rates of amyloid beta 42, such as those seen in older participants, were associated with clinical symptoms of Alzheimer’s disease, such as memory loss, dementia and personality changes. Scientists believe the brain disposes of amyloid beta in four ways: by moving it into the spine, pushing it across the blood-brain barrier, breaking it down or absorbing it with other proteins, or depositing it into plaques. This research was supported by the National Institutes of Health (NIH), grants R01NS065667, K23AG030946, P50 AG05681, P01 AG03991, UL1 RR024992, P30 DK056341, P41 GM103422 and P30 DK020579; the Adler Foundation; and by philanthropic gifts from Edwin and Barbara Shifrin and Jeff Roschman. Patterson BW, Elbert DL, Mawuenyega KG, Kasten T, Ovod V, Ma S, Xiong C, Chott R, Yarasheski K, Sigurdson W, Zhang L, Goate A, Benzinger T, Morris JC, Holtzman D, Bateman RJ. Age and amyloid effects on human central nervous system amyloid-beta kinetics. Annals of Neurology, online July 20, 2015. But as we can see bellow the grape seeds and the peels of grapes,contains anthocyanins or anthocyanidins(as CY3G)and quercetin.Anthocyanins that improves venous and lymphatic function(1),(2).And the antioxidant,Cyanidin 3-O-Glucoside(CY3G,present in seeds and peels of grapes)is protective against the betamyloid-induced impairment of learning and memory .and attenuated the betamyloid-induced tau hyperphosphorylation(3).Quercetin in grapes,is a powerful antioxidant,between others benefits,ameliorates AD disorders and cognitive dysfunctions(4). 1)"Clinical and Capillaroscopic Evaluation of Chronic Uncomplicated Venous Insufficiency with Procyanidins Extracted from Vitis Vinifera" Minerva Cardioangiol-1999-Proanthocyanidins from extract of grape seeds showed evident improvement already during the first weeks of treatment,with absence of adverse events in the treatment of non-complicated chronic venous insufficiency"
2) Free Radicals Scavenging Action and Anti-Enzyme Activities of Procyanidines from Vitis Vinifera.A Mechanism for their Capillary Protective Action"- Arzneimittelforschung(1994):The scavenging by procyanidines (polyphenols from Vitis vinifera seeds) of reactive oxygen species involved in the onset and the maintenance of microvascular injury,has been studied. 4)The Flavonoid Quercetin Ameliorates Alzheimer's Disease Pathology and Protects Cognitive and Emotional Function in Aged Triple Transgenic Alzheimer's Disease Model Mice.-Neuropharmacology. (2015)-Quercetin reverses histological hallmarks of AD and protects cognitive and emotional function in aged AD mice.